So many people are searching for Andhra Pradesh Ration card official website. Don’t worry about that here is the Official Homepage www.icfs2.ap.gov.in. 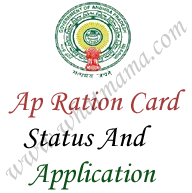 Who want to check your Ap ration card status (White Card or Pink card) to access website want to login with username: guest & the password is: guest123 so who want to check their ration card status those candidates want to Login at website. Andhra Pradesh Government was issued White ration cards for 1,00,000 Below Annual income Families and Pink Color Ration Card was issued for More than 1,00,000 Annual Income candidates . For white ration card holders get ration (rice, wheat, kerosene, Sugar Etc...) every month neared FPShop. How many types of Ration cards Available?? How to check ap ration card Details online? Just follow these four simple steps you will be able to check status online.